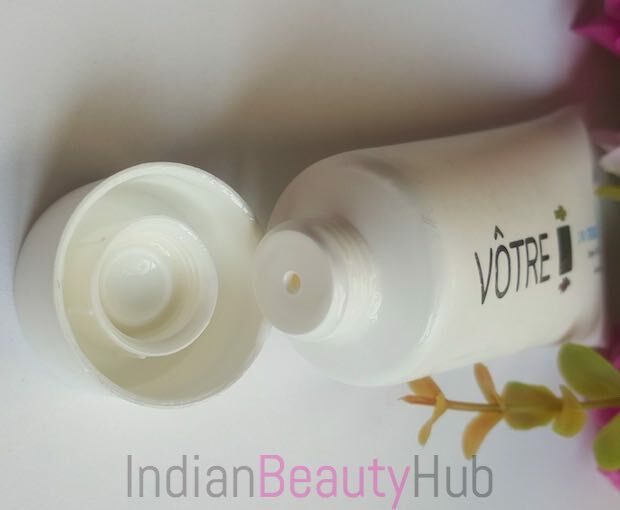 Hey everyone, today I’m reviewing the Votre 3 in 1 Creme Cleanser. 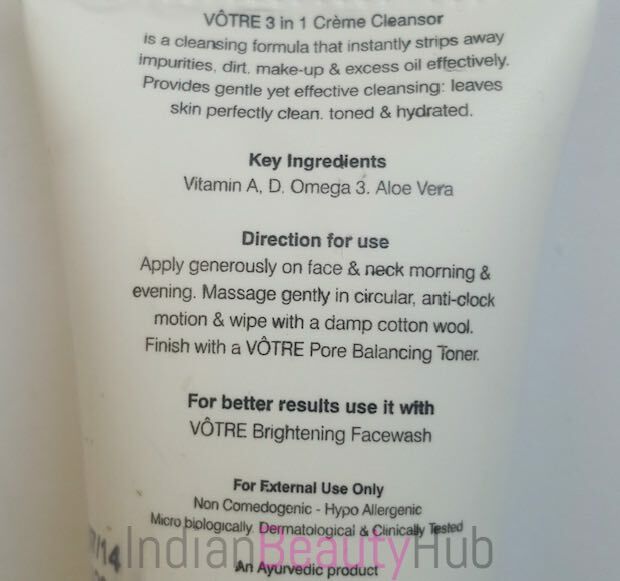 Votre is an Indian beauty brand that offers a range of 100% vegan skin care products including face wash, scrub, toner, moisturizer and face masks. I have already reviewed a few of the Votre skincare products in the past, you can read their reviews here. Packaging: Votre 3 in 1 Creme Cleanser comes in an easy to use tube pack with a screw cap. Overall the tube packaging is compact, sturdy and trave-friendly. But its opaque packaging won’t allow you to see the remaining product inside the tube. Texture & Fragrance: Votre 3 in 1 Creme Cleanser comes in a milky white color and has a little runny consistency. It has a mild fragrance that is almost unnoticeable. 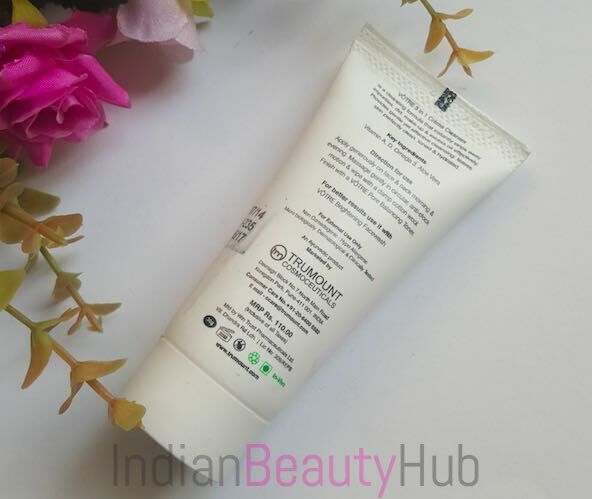 Price & Availability: The price of the Votre 3 in 1 Creme Cleanser is Rs.110 for 30g and you can buy it online from Jabong.com, Flipkart.com or Purplle.com. Efficacy: Votre Creme Cleanser is a 3-in-1 skincare product that cleanses, tones and hydrates the skin. I generally use this cream cleanser when I’m feeling lazy and don’t feel like following the proper CTM (cleansing, toning, moisturizing) routine. I take a generous amount of this cream and massage it nicely on my slightly damp face. It feels like you are massaging a light lotion on the face. After massaging it for 2-3 minutes, I wipe it out using a wet cotton pad. 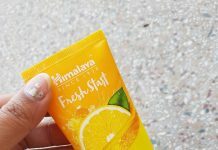 It removes impurities, dirt, oil and mild makeup very nicely and leaves my skin soft and hydrated. 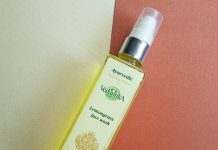 I have oily skin that becomes dry during the winters and this cream cleanser helps to maintain the skin’s moisture level. 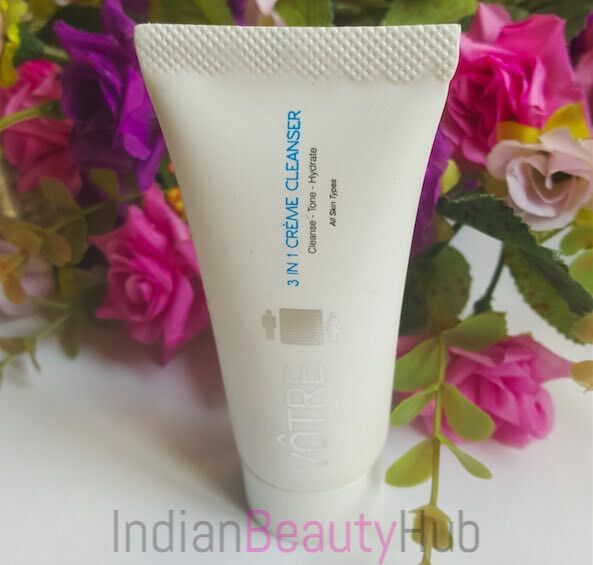 Votre 3 in 1 Creme Cleanser is an ideal product to carry while traveling or when you are in a hurry and don’t have enough time for proper CTM process. But you need to follow it with a good moisturizer in case you have dry skin, whereas oily skin people can skip their moisturizer after its usage. A mild face cleanser that removes impurities effectively. It leaves the skin clean and nourished. 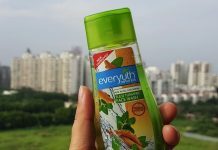 Enriched with 100% vegan plant extracts. Doesn’t cause any breakouts to my sensitive acne prone skin. Ideal to carry while traveling. Quite expensive, the quantity provided for its price is very less and this 30g tube will last only for 15-20 usages. The full ingredients list is not given. 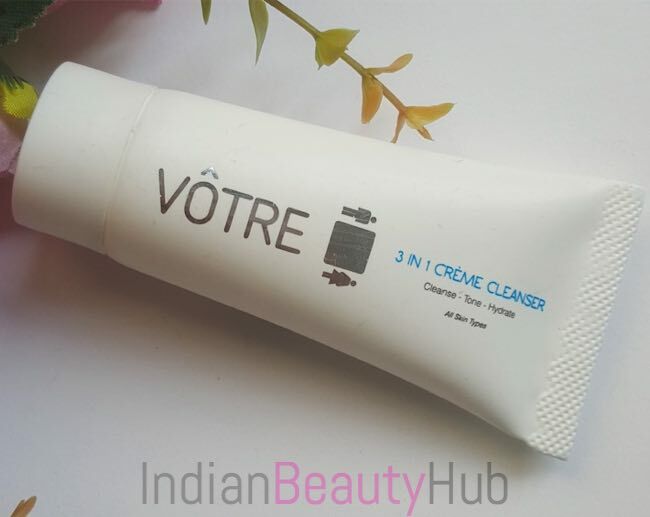 Overall Votre 3 in 1 Creme Cleanser is a pretty decent product and it does what it claims. The only downside of this product is its high price. I don't think I'll buy it again as I didn't find it a value for money and you can get almost the same results from a regular cleansing milk at a comparatively lower price. Usage-wise I liked the product from your review, I don’t understand why they haven’t mentioned all the ingredients.